Outside court, one of Assange‘s lawyers, Jennifer Robinson, said Assange would fight extradition to the United States. 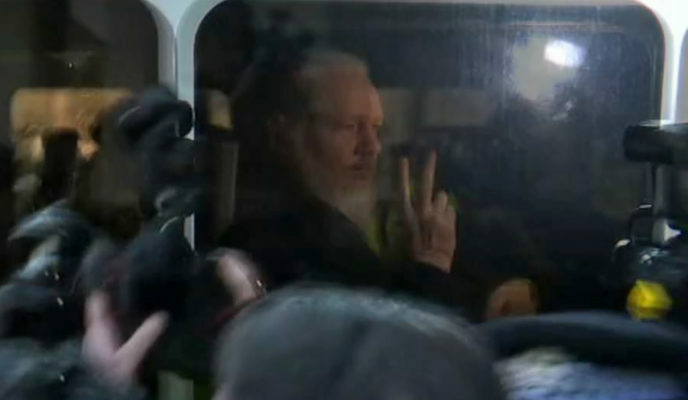 She called the action against him “a dangerous precedent for all news media.” Robinson said she was seeking medical care for Assange, whose health she said has suffered during his time in the Ecuadoran Embassy. The lawyer said Assange told her to thank his supporters and to say, “I told you so,” to the world – presumably a reference to Assange‘s long-held prediction that the United States would seek his arrest and extradition. “WikiLeaks – I love WikiLeaks!” he said in October 2016 at a rally in Pennsylvania, waving a report on the latest disclosures. “Boy, I love reading those WikiLeaks,” Trump said a few days before the election after a new dump of emails. The Ecuadoran president specifically cited Assange‘s involvement in what he described as WikiLeaks’ meddling in the internal affairs of other countries, referring to the leaking of documents from the Vatican in January. From Moscow, Edward Snowden, the fugitive American former National Security Agency contractor, described Assange‘s arrest as a violation of press freedom. Assange‘s expulsion from Ecuador’s embassy reflects a shift in the country’s politics since it first extended refuge to him.